If you have an itch to learn, now's the time to scratch it. No doubt, HIT is an expanding and dynamic field. Consequently, many innovative education initiatives have emerged to address the industry's ever-changing landscape and enable physicians and other medical professionals to become more adept at effectively using the powerful technology available to them. The Regenstrief Institute, a research organization of the Indiana University School of Medicine, offers the Regenstrief EHR Clinical Learning Platform, a content delivery and evaluation tool. The platform was created with the American Medical Association (AMA) to address the gap between what physicians are taught in medical school and what they experience as independent practitioners. A web-based, password-protected subscription service, it utilizes a database of thousands of patients and their real-life encounters (all personal information is deidentified) to help prepare students for their professional careers and provide them with valuable feedback as they learn. Originally designed solely for medical students, the learning platform is also being used in nursing, radiation technology, and pharmacy training programs. "The Clinical Learning Platform was started by the AMA to address changes in medical education. As the EHR has proliferated, access to the EHR for medical students has become more difficult for many reasons. Essentially, driven by Medicare, attending physicians who formerly were able to take ownership of student notes are no longer able to do so," says Blaine Y. Takesue, MD, a research scientist and director of EHR development at Regenstrief Institute. "Legally, some health systems don't want to see conflicts between what the medical student writes and what the doctor writes. Often, from a billing perspective, health systems don't see a value in training medical students on the EHR if the students aren't able to document for them." Within the platform, local users are able to build their own content. For instance, in the program's beta version, users have access to a tool to create specific alerts. There is also a query tool to allow relatively inexperienced users to perform sophisticated queries. "You don't have to be a computer expert to create content," Takesue says. "A lot of medical schools are asking for content to be built. We're doing that now, including adding such things as prescription writing and risk factors for falls. But we didn't want to limit content development. Still, many users are busy and want cases off the shelf, and we're working on developing that type of product for them." One of the platform's objectives is to provide dual terms of access, enabling students to access the EHR while the EHR is simultaneously delivering content. "It's one thing to teach how to take care of a hip fracture; it's another to take care of a real hip fracture with real data. It's about delivering realistic patient information to students vs static material out of a textbook," Takesue says. Designed by physicians, the Clinical Learning Platform differs from those offered commercially. "Just because a commercial system does something a certain way, doesn't mean it's the best way," Takesue says. "For this reason, not only was the Clinical Learning Platform designed to give medical students access to the EHR, but also to have them consider EHR design. Until now, we've basically copied paper processes into commercially available EHRs, but that's not using technology to its fullest advantage. You have to go hunting around the chart to look for information, much as you do with the paper chart. Our students become more familiar with how a digital EHR should work efficiently, then when they are in their professional practices, they should be asking vendors for better user design." Dustin Worth, DO, clinical medicine coordinator at WWAMI (Washington, Wyoming, Alaska, Montana, and Idaho) Regional Medical Education Program and collaborative medical school, agrees. "When I first started looking for an educational platform, it was from a perspective of the scenarios we do when we put medical students in a room with a standardized patient—let them interview the patient, do an exam, and come up with a diagnosis," Worth says. "I wanted a program that would enable us to integrate a computer into the scenario. I saw the Clinical Learning Platform and thought it was really useful." The WWAMI program offers case-based instruction with several student groups collaborating on a clinical case at one time. "When I first spoke with Blaine [Takesue], he talked about how they can have pop-up dialogue boxes to help [students] interact. Having this feature means we can present the case within the EHR itself. A pop-up enables students to select what labs they want to order, for example. Then the lab results appear via pop-up, and the students can interpret them," Worth says. Worth and his team used the platform to create a hybrid scenario. "We had a standardized patient. Half the students used paper charts and half had the Clinical Learning Platform. Our goal was to see how they would adapt since none of the students had been in a room with either type of chart," he says. The tool has been well received thus far, Worth notes, adding that students are particularly satisfied with the case-based presentation and how they are able to adapt to the EHR. "One thing some of the students didn't understand, though, is why they had to learn one type of EHR when they would be using something different professionally," he says. "At this point, the students don't realize the wide variety of EHRs that are out there and what they could potentially be working with." Takesue points out that having access to the EHR is particularly important because most medical students are not pursuing the more technology-oriented aspects of the medical profession. "I'm a medical informatician. When we set out to create this program, we didn't do so to benefit people like me," he explains. "Instead, more students graduate to become service-line chiefs, department chairs, or heads or directors of practices. Still, they have to have the knowledge to be able to make EHR decisions. This is information that all practitioners have to have, knowledge of the technology no matter where you are in the practice. "Along with the AMA, Regenstrief wants to make an impact," Takesue continues. "If we can let students graduate with a better understanding of EHRs, they'll be better prepared to deliver care." The AMA is supplying CPT content to Elsevier for a set of new education modules on CPT coding. Currently in the prelaunch phase, the modules are slated to be available during the first quarter of 2018. • Services that were once provided in inpatient settings are moving to outpatient; HIPAA mandates that outpatient services are coded and reported using CPT. • Because the CPT code set is constantly evolving to reflect advances in contemporary medical science and technology, education must be provided each year. • Professional services are described using CPT codes. Through the initiative, both Elsevier and the AMA hope to empower the workforce to accurately code medical procedures in a way that streamlines communication across the health system, reduces administrative and rework costs, improves data, and instills staff confidence so that they continually seek professional growth and improvement. "Education is provided in an online format—available anytime, anywhere, for any audience—that is easily grasped by learners," Neville says. "And it's focused on the services within each of the specialties that may be of most concern to coders, whether high volume, high dollar, high visibility, or high coding difficulty. The program is written for the adult learner to easily and readily apply learned knowledge to real-life situations." To address the ongoing changes in health care, AHIMA offers a wide range of education options, including experiential opportunities. AHIMA's VLab, for example, provides HIM students the opportunity to work with multiple health information systems commonly found in HIM workplace settings. "The VLab offers both content—lessons, assessments, and patient records—and system access," says Desla Mancilla, DHA, RHIA, AHIMA's senior director of academic affairs, noting that students can access a variety of systems, including those from Meditech, drchrono, 3M, Find-a-Code, Nuance, Argo, Solcom, Tableau Data Visioning, and Ciox Health. "The use of the content and these systems is a way that HIM students can stay abreast of how technology is influencing the kinds of skills and knowledge they need to be successful in a changing industry." Experiential learning helps ensure AHIMA students are well prepared and the HIM profession remains vital. In a similar vein, the initiative HIM Reimagined emphasizes academic preparation and the foundation of an HIM career, while promoting continuing education for established professionals. The academic preparation component begins at the college level with core-curriculum competencies. "AHIMA gets involved with curriculum writing at all levels—associate, baccalaureate, and graduate degrees," Mancilla says. "Regardless of what academic level the professional is at, there are some competencies they have to know. For instance, they have to know about privacy and health information. So as we address curriculum, we look at the core competencies across three academic levels. What's the core at all three levels? How does it differ among those three groups?" AHIMA sets the core competencies, which the organization identifies through market research, analytical tools, and myriad other methods. "We work through CAHIIM [the Commission on Accreditation for Health Informatics and Information Management Education], which releases those curriculum standards that AHIMA created, along with other standards CAHIIM adds to them," Mancilla says. "To test for the RHIT or RHIA credential, students have to follow those competencies. Schools incorporate them into their curricula." Santa Fe College in Gainesville, Florida, a predominantly two-year college, offers two HIT certificate programs, one in informatics and one in medical coding and billing. Those certificates include course work that can be applied to the Associate of Science (AS) degree in HIT with the opportunity for students to obtain an advanced technical certificate in privacy and security. "These specialty tracks were developed with AHIMA's collaboration three years ago," says Julie A. Shay, MBA-HIN, RHIA, the director of Santa Fe's HIT program. "The offering of certificates assists the student to ultimately articulate into the AS HIT degree. By developing and providing these specialty tracks, colleges assist fulfilling the HIM workforce need within the region. We capitalized on this opportunity, and I am glad that we did. I am hoping others have too, as the HIM Reimagined initiative advocates for these specializations within the AS HIT/HIM degree." Having already completed a four-year degree in animal biology, Lynda Hilliard is pursuing an AS degree in HIT at Santa Fe College with plans to reenter the workforce. "I returned to school leaning toward a career in coding. Now I'm interested in becoming a certified tumor registrar," she says. Hilliard credits Santa Fe's curriculum, which includes basic sciences, anatomy and physiology, medical terminology, coding, legal aspects of health care, health insurance, HIT, health care statistics, and quality improvement, along with real-world experience, for helping her find direction in her new career. "The professors in our program bring so much industry knowledge and experience to the classroom," Hilliard says. "And the school helps us find work through professional practice experiences [PPEs]. We have three separate PPEs—one at the end of the first year, one at the beginning of the second year, and one at the end of the final semester. Because of the curriculum at Santa Fe, I feel extremely prepared for the PPEs and am confident as I enter the facilities. People remember you; the HIM community is very small." Shay adds that Santa Fe's already robust HIT program is continuing to grow. "We're looking to the future of where our industry is going. There are going to be new competencies," she says. "For example, educators are developing an HIM core that will transcend over all three levels of education: two-year colleges, four-year degrees, and graduate education. There will be a spinoff within the Associate of Science HIT degree with focus on specific specializations such as revenue cycle management or data analytics and informatics." Shay and her colleagues encourage students to become HIM leaders. 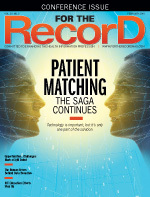 "We advocate for them to be willing to educate the industry on the value HIM professionals bring to any organization and educate consumers on their personal health record rights," she says. "Ultimately we want the students to provide value to the industry and for the students to become leaders across all aspects of the health care industry. We want to optimize consumers' health by promoting patient-centric health care, along with educating them on personal health information management." Once HIM professionals have a strong foundation to begin their careers, AHIMA has developed continuing education opportunities in order for them to remain at the forefront of their respective fields. "We deliver content in many ways, through online sessions, in books, in face-to-face meetings, and at conferences," Mancilla says. Continuing education opportunities include attaining advanced degrees in health informatics, business, education, public health, and medicine. In its 2017 white paper "HIM Reimagined: Transformation Starts With You," AHIMA announced a goal of increasing the proportion of "members who hold graduate degrees to 20% of our total membership within 10 years." "CEUs are important to maintain certifications but they are equally important for professionals to stay current for the existing HIM landscape and the needs we anticipate in the future," Mancilla says. "And while recertification is critical, we want our HIM professionals who are interested to pursue graduate levels of education. We encourage them to become the professionals, researchers, and instructors who will emerge as leaders in their respective HIM fields."